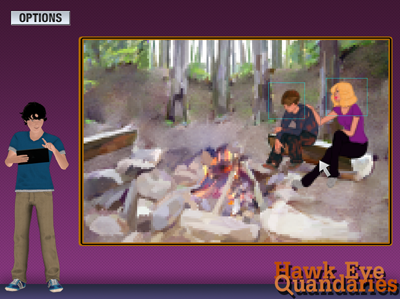 Today I bring you Hawk Eye Quandaries, a parody/homage to EA*Kids/Stormfront's amazing edutainment title "Eagle Eye Mysteries!". Welcome to Anytown USA... USA! You play as either Justin or Josie Hawk, a Pair of Twins who go around solving crimes although crime can be the most loosest definition of the word! I'm fairly happy with the way the games has turned out. The idea is that I needed a little more practice before turning my hand at a bigger project which I'm now developing and I thought something that once I built the main concept, I'd be able to add to with ease. One of the things I love about Eagle Eye Mysteries is not just the concept, but how vast it was, the original easily had 60 cases in it... Well this build of the game has... 3. But I have made plans and a pipeline to add three new cases a month, and now that I have method to my madness I think this will be easily achievable (For at least the next couple of months anyway) and my plan is to have a site where anyone can suggest a case to be built. Since I've created the game to have it's own saving technique rather then using the standard AGS saving technique, adding cases won't invalidate previous saved games and I can work on giving the game improvements. Anyway, If you'd like to give it a try, the link is here. Looks like a pretty impressive and ambitious project! Congrats on the release. Nice idea about having community-inspired cases too. Nice idea about having community-inspired cases too. Looks good. I'll check this out this weekend. And the characters look adorkable!!! It says the download started but actually didn't start. gamejolt never works for me, and I'm on firefox too. It didn't work for me on Firefox or Chrome. Well for those of you who have trouble with Game Jolt, The game is also hosted on our website: here. I'm surprised that Game Jolt's giving you trouble but at least there's always alternatives! Thanks for checking out the project! I'm liking this game a lot so far: It has a real feel of innocence about it. I'd imagine some kids around 8-12 years old would go nuts for this! And I love the sibling rivalry between the twins, and especially the not-the-sharpest-tool brother, but you give him his moments now and then as well. The supporting cast of characters are also lovable and look awesome! I can tell a lot of time and love went into designing their looks: You can really tell at a glance what their personality is like. I have a few classes at my school that just eat up this kind of detective stuff, so I'm sure going to be using your game in lessons. I will probably make some comprehension-style quiz sheets for them to work on after playing a case. I could share those with you if you are interested in having such support teaching materials also available on your site for download with the game: I can see this being very popular in classrooms! Really? Yeah! That would be an awesome thing to do. - Though that pushes the idea that I definitely need to develop a adult-content lock for cases that are more risque. Since I'm spending all my after work effort at the moment getting a demo ready for GDC the next case pack won't hit until after March 20th at the earliest, But the Wiki for case building suggestions should be up in the next week or two while I render. Might even make it a double case pack to make up for that. 6 cases instead of 3. Mandle, if you're interested in joining the Beta Testing team (Which I've sickeningly referenced as the Hawklings) or talking more about Comprehension Sheets, email me at natalie@reventuregames.com.